It was just a year ago when the world first formally met the olinguito. The discovery of the creature - the first mammal discovered in the Americas in 35 years - made it the smallest member of the family that includes raccoons, coatis, kinkajous and olingos. Thanks to crowdsourcing, we now know a whole lot more about it. In the year since the announcement was first made, Kristofer Helgen, curator of mammals at the Smithsonian's National Museum of Natural History and leader of the team who described the animal, has received email after email, letter after letter, about the critter. Now that people know what the olinguito looks like, those who live, work, or travel within its natural range are in a position to look for it. On the first anniversary of the discovery, Smithsonian Science describes how Helgen and his team put together everything they now know about the 2-pound carnivore, half of which came from regular people. While not every report or photo proved to be an olinguito, many were, helping Smithsonian scientists confirm plants that the olinguito ate, what types of trees it lived in, its nesting behavior, and yes, even confirming that a baby olinguito is cuter than an adult, thanks to photos taken by an employee in the Mesenia-Paramillo Reserve in the mountains of Colombia, now known as an important site for olinguito conservation. Another important aspect to this crowd sourcing method of research was mapping the olinguito's range. While the team did have a handful of records from decades old museum specimens, and field sightings of their own from 2006, they did not have the capacity to scan large swaths of cloud forest habitat in northern South America. But now local citizens, vacationers, and scientists doing other fieldwork in the area provided an expansive network of eyes, ears and cameras. 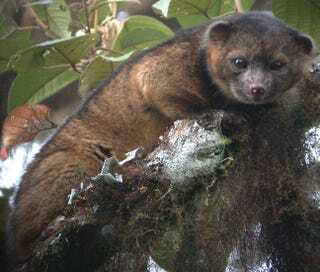 With each validated report of an olinguito sighting, the team was able to mark the locations on a map, at times confirming the animal's existence in areas they had suspected it to be, but also illuminating new areas, thereby expanding the team's understanding of the olinguito's native range. Initial hopes that the olinguito might serve as a charismatic ambassador for the conservation of dwindling Andean cloud forest habitats may be bearing fruit. Helgen says that this project "reminds us that observant naturalists, all over the world, can make contributions to knowledge about the diversity of life on our planet." Header image via Helgen et al.